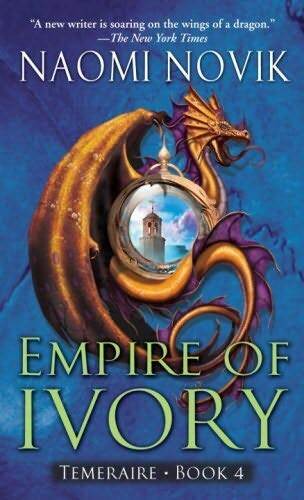 I have dispensed with the summary for this book to avoid spilling the beans on Empire of Ivory (Book 4). This is a darker piece, with Laurence and Temeraire forced to make difficult decisions on their own. Both go through a character building process, while trying to defend England from France’s invasion. Temeraire is forced to deal with the complexity and irrationality that often plague human psychology as he learns human politics and negotiation. With straightforward and simplified draconic ways of thought, Temeraire is often frustrated at how difficult humans can make life be when things seem to be plain as day. On the other hand, Laurence must temper his ideals and his inherent insistence on righteousness, sometimes misplaced, which earns him more harm than good. He is faced with the need to reassess his values when they prove to be impractical nor right anymore. For instance, Laurence is challenged with situations where authority isn’t always right and can be in serious conflict with his personal sense of right and wrong. The action does not let up in this one as well. Novik perhaps intends to let her duo travel the world as the next destination for them is Australia. Books two to four see them through China, the Middle East, Germany, Russia, and Africa. I can’t wait for the sixth book, Tongues of Serpents due in the middle of this year. One caveat though: if you plan to read the Temeraire series, you must start with Her Majesty’s Dragon (Book One). You would not appreciate this series should your first book be other than the first. Novik hardly takes the meticulous pain of backtracking and if she does, it is rather cursory as this is the type of series that must be read chronologically. China’s Emperor allows William Laurence and Temeraire to go back to England. As they were about to do so, an urgent missive instructs them in no uncertain terms to bring back three dragon eggs from the Ottoman Empire or suffer the consequences. Laurence, Temeraire and his crew embark on a dangerous crossing across desert and mountains. On the way, they meet feral dragons which they end up befriending. Temeraire, having experienced the more exalted treatment of dragons in China, speak to the ferals about a better way of life — better accomodations, food, etc. His Chinese exposure, his witness of the slave trade, and his voracious reading have also made him question the order of dragon treatment in England where he perceives his kind to have limited choices and freedoms. Temeraire is growing a sense of social justice for dragons in general and is determined to spearhead changes for the dragons’ lot, starting with the English Parliament. With the uncontrollable, undeducated ferals breaching etiquette, Laurence and his company make a bad start with relations at the Turkish border. The mission becomes more and more disastrous at the Turks’ refusal to hand over the paid eggs and at the machinations of an albino dragon, Lien, who had become Temeraire and Laurence’s vengeful enemy in China. The situation forces Laurence’s party to take drastic measures and to flee to the Prussian side where they fight as allies against the vast, encroaching army of Napoleon. 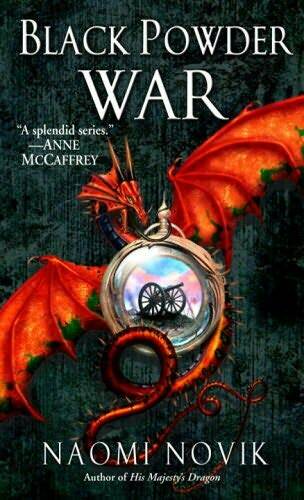 Laurence and Temeraire finally fly home to England only to find a new threat—a plague of the common cold, fatal to dragons with no known cure. With the threat of decimation hanging upon England’s aerial corps and the proximity of Bonaparte’s armies, Laurence, Temeraire and a bedraggled section of the aerial corps journey to Africa to find a cure. In their desperate search, they are forced to discover a secret kingdom deep within the continent’s interior protected by African dragons who had forged a unique bond with its people. These Africans have engaged in their own war against the colonial slave trade. Danger harasses them throughout the tale and culminates with Laurence having to make a difficult life-changing decision. What keeps one riveted on these books? It is first and foremost, its dragons. They are the crux of the series; hence, Novik takes great pains in constructing her dragon world, building on different breeds and personalities, dacronian habits, likes and dislikes, their sexuality, intellectual capacities, etc. She then melds her draconian world to a page in history, selecting the Napoleonic War. Taking care to stick well to factual historical events, she allows us to escape to an alternate reality. To keep us further immersed, Novik continues to develop her principal characters, Laurence and Temeraire, albeit almost exclusively which simplifies the story in a way that the reader is focused on these two characters. One begins to know them closely so much so that he is caught in their intimate bond and the reby, the story’s spell. As she develops Laurence and Temeraire, she makes them gradually aware of life’s truths, shattering notions and shedding innocence. From a hatchling to a young adult dragon, Temeraire goes through gradual knowledge of life’s complexities, injustice and double-sidedness throughout the series. He increasingly develops a sense of social justice. With Temeraire’s progressing questions and some uncontrollable events, Laurence , too, is forced to shift his paradigms to break previous staunch beliefs especially in the area of England’s superiority and political system. So far each book, after the first, satisfyingly segues into action-packed continuations, the author cleverly introducing new, interesting dragon and human characters, pumping new life with new events and making one want to read more and more. With all these, Novik is certainly going down the right path toward creating a marvelously enjoyable series. I have enjoyed them, reading much well into the night , caught up in finding out what’s next. 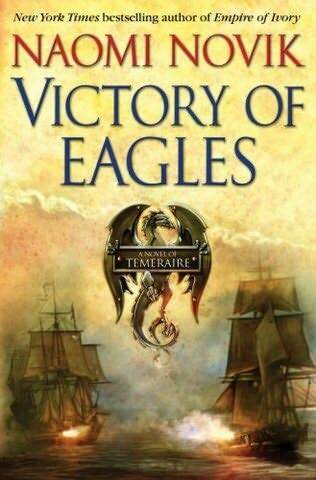 I am certainly out to get the fifth book, Victory of Eagles, the latest published to date . So far, so very good! Not to mention that from premiering only in 2006, the books have come in pretty rapidly compared to the usual plodding rate of releases in most series writing. This year, Tongues of Serpents is scheduled to be released on the thirteenth of July (as per the official website’s announcement on http://www.temeraire.org/). China gets wind of where the prized dragon egg, their lost gift for Napoleon, is. An angry Chinese Prince Yongxing and his delegation arrive in Britain and demand the return of their dragon. Temeraire is discovered to be a Celestial dragon, the rarest of Chinese breeds. Venerated like royalty, the Chinese believe that only those of royal blood are worthy companions to these Celestials. To their utter mortification, they discover their dragon would take no other companion but a common aviator, Capt. Laurence. Pressured by China with the gloomy spectre of a Chinese alliance with France, Laurence’s superiors force him and Temeraire to go with the delegation back to China. Through the perils of a long voyage, Temeraire finally arrives in a country where dragons are treated like humans, with rights to education, property, and remuneration. Chinese dragons also have a social stratification according to breed and have the chances of gaining wealth or falling into poverty as much as any human. For Temeraire, his life in China as a Celestial is every dragon’s dream; but, China is not all that ideal after all, for diabolical plans are afoot. Throne of Jade sees much more action. The story takes a on a faster pace than the first book as Novik throws in a lot more danger for all characters involved. She injects a lot of humor, too, about 19th century British exposure to the Orient, making her characters have a lot of droll moments coming to terms with unfamiliar things like chopsticks and century eggs. Novik successfully mimics the dry, genteel British verbal and writing style of the early 19th century which has a tendency to downplay or understate everything, even such incidents as death, danger, etc. so that the full emotional impact is not felt and comes across as trivialized. Injury to a crew member, for instance doesn’t seem to be of importance; however, emotional emphasis is given when the principal characters, Temeraire and Capt. Laurence are at stake. Throne of Jade makes one immediately reach for Black Powder War, the third book of what promises to be an exciting series. I’ve missed out a lot on YA books last year so I decided to start on a genre that had been my reading preference in highschool — elves, dwarves, genies, dragons, magi— anything that smacks of high fantasy. This is a series of which I only have four books. As to why I started on a series novel again (I had developed a wariness to unfinished series books), the pull was just there as the books have been staring at me from their shelves for two years now. The author promises nine books, five of which are published. 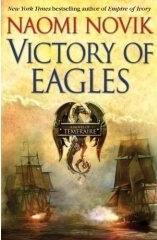 The fifth book, Victory of Eagles has just been released in 2008. The novels are all set in an alternate history during the Napoleonic wars, concentrating on the French invasion of England. In this alternate world, dragons are very much a part of life, indispensable in the military for they are the century’s air force along with their human “pilots” or aviators. What is central to this series is Novik’s world of dragons which she goes into detail, expounding on the different breeds, their weight, class, physical and mental abilities, preferences, etc. Novik’s dragons are, like humans, varied in breed, intelligence, and ability. The more intelligent ones have highly developed linguistic and analytical capacities. She also imbues them with very human emotions so that we get to know them and identify with her dragon characters on a personal level. Her dragons are what caught my interest and made me stick to her series. So, I’m settling down to review the series which Peter Jackson (best known as director of Lord of the Rings) is planning to do a miniseries on. The English make an immense discovery of a Chinese dragon egg aboard a French ship they had taken in battle. As the shell is hardening and land far away, English Captain James Laurence, has no choice but to await the hatching and be ready for the loss of any crew member the hatchling would take to. As soon as the little dragon allows a harness to be donned by someone, it is an inviolable law that the chosen person be duty-bound to leave his naval career, ambitions, and plans of future wife and family for a life of an aviator, a career demanding a lifelong bond with his dragon. The egg hatches and the first person the baby dragon takes to is Captain Laurence. With a deeply imbued sense of duty to country, Laurence bravely accepts the choice, names the dragon Temeraire and divests himself of naval rank and accoutrements to prepare himself for aviator life. As Captain Laurence begins his association with Temeraire, both start a deep love that would strengthen through their training and battles as each discovers himself and the other. Novik charmingly evokes the feel of the Napoleonic era with her characters’ genteel prudish language, cultural notions, dress and code of conduct of that bygone era. Book One displays how interesting and endearing Novik’s dragons are so that readers get excited about reading Book Two : The Throne of Jade. While intimidating, her dragons are lovable, intelligent and excellent companions. You’d wish they really existed. As an added bonus, her dragons and their aviators form filial-like bonds that add to the escapist’s pleasure of identifying with the aviator. His Majesty’s Dragon is a good first book that entices one to immerse in the series. Novik’s world is so elegantly well-detailed that I really don’t mind spending my time immersed in it. Excellent -- A Bookshelf Gem Outstanding ---- Top-Notch! Good ------ Enjoyable; Cool! Mediocre ------ Ho-hum; OK Ugh! --- Trash! Don't Bother! Farewell, Michael Crichton… You will be sorely missed.